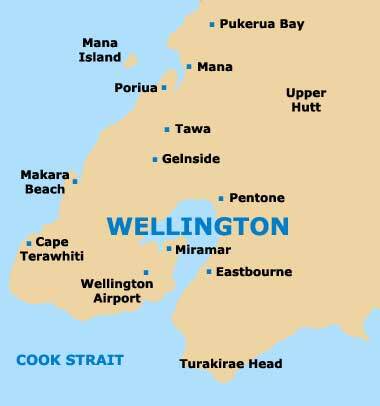 Being the capital city, it will come as no great surprise that Wellington contains a number of the most important landmarks on the North Island. Some of these have origins in the late 19th century, while others have arrived in the new millennium of the 21st century. Both Lambton Quay and the neighbourhood of Thorndon are particularly interesting parts of the city. Developed in the early part of the 1990s, Civic Square lies in the heart of central Wellington and is a modern pedestrianised square, resembling typical Italian piazzas in style. This spacious public plaza provides a quiet sanctuary away from the city's busy traffic, bounding both the financial and entertainment districts. 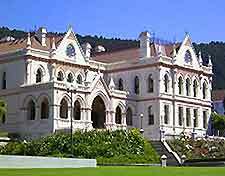 Located in southern Wellington, the Government House resides within the suburb of Newtown and is home to New Zealand's Queen's representative, better known as the Governor-General of New Zealand. Other landmarks of note within the city's environs include the Katherine Mansfield House, the National Library of New Zealand, the National War Memorial, the Old Government Buildings and the Wellington City Library. Antrim House is a particularly grand and historic building standing within the city centre. This impressive Edwardian-Italianate style mansion was built in the early 1900s for Irish immigrant Robert Hannah, who became a wealthy local businessman and actually originated from County Antrim, hence the house's name. There are many original period features present, together with an array of antique furniture, landscape and portrait paintings, and a number of important collections. The house is close to Lambton Quay and greatly contrasts with the surrounding modern high-rise towers. The City to Sea Bridge is a notable pedestrian bridge, built in 1994 to connect the city centre with the waterfront district. Spanning the Jervois Quay and featuring impressive architecture with unusual, intricately detailed Maori carvings and wooden art works, the bridge provides breathtaking views of the city's skyline. Many attractions are close by, such as both the City Art Gallery and the Town Hall. The Civic Square has long been a major landmark against which many local distances and locations are measured. Attractions here include a thriving street café culture, seating areas, lawns and views of the harbour area, as well as the iconic spherical sculpture depicting fern leaves, which is suspended above the centre of the square and appears to almost float. The plaza borders Cuba Street and the Lambton Quay shopping area and attracts large crowds at lunchtimes, whilst also hosting a number of popular outdoor events. Recently renovated between 2008 and 2011, at a cost of more than $40 million, the buildings of the Government House date back to 1910 and feature an imposing facade, as well as an equally grand interior, full of antiques, paintings and heritage features. Government House opens its doors to the general public at least once every year and this is usually well publicised. Home of world-famous writer Katherine Mansfield, who was born here in 1888 as Katherine Beauchamp, this grand townhouse can be found in the city's Thorndon district, being just off Murrayfield Drive and Hobson Street, and nearby the K. Mansfield Memorial Park. Celebrating the history of this important New Zealand writer, the house has become a popular tourist attraction, being listed by the New Zealand Historic Places Trust. Visitors will find original Victorian features, furniture and decor, together with paintings, photographs, videos and a number of historic documents. The Hutt River is one of the area's most important natural landmarks and can be found just outside of Wellington, in the Hutt Valley area. Containing many scenic picnic spots and walking trails, the river meanders its way through much of the valley, before finally ending up in Wellington harbour. The Massey Memorial is located on the eastern outskirts of Wellington and is situated in an elevated position, with magnificent coastal views across the Miramar Peninsula and the harbour area. Sited on Point Halswell, on the Miramar Peninsula itself, this scenic spot serves as the mausoleum of New Zealand's 19th Prime Minister, William Ferguson Massey, who was in office between 1912 and 1925. Of note, this simple curving stone memorial stands on the site of a historic fort, with this spot being known for the part it played during the First World War. Separated from St. Paul's Cathedral by Molesworth Street and dating back to the middle of the 1960s, the imposing National Library of New Zealand building, in the Thorndon district, is home to a wealth of important artefacts, historic documents, books, maps and paintings, many of which are well over 100 years old. With large exhibitions, old photographs, interesting displays and plenty of things to see and do, this has become a popular tourist attraction, as well as a striking landmark in its own right, with its distinctive modern architecture and sloping concrete block walls being easy to recognise. Located within the campus of the Massey University and close to the Basin Reserve Stadium, the National War Memorial is dedicated to those from New Zealand who have lost their lives as a result of war. With a number of poignant exhibits, including displays in the Hall of Memories, the memorial hosts several important events each year. Based on Whitmore Street and in the Lambton Quay area, the Government Buildings Historic Reserve is one of the world's largest wooden buildings and dates back to 1876. The building features block corners, slab wooden planking, Italian-style architecture and a lavishly decorated interior, and has been listed as a 'Category I' building by the New Zealand Historic Places Trust. The grounds are open to members of the general public and feature some rare and exotic examples of indigenous flora. The Premier House is situated next to the Stellin Memorial Park, on Tinakori Road, and is the official residence of the Prime Minister. Dating back to the mid-19th century, this grand landmark building was used for a number of different purposes between 1843 and 1990, including a brief stint as a dental clinic for children, until being thoroughly renovated and returned to its former use as the home of New Zealand's Prime Minister in 1935. The Premier House is not generally open to the public, although seasonal events are occasionally hosted at this attractive building. Built in the mid-19th century, Bishopscourt is home to the main office of New Zealand's Anglican Church and can be found within the northerly Thorndon district. With classical architecture and a number of detailed features, this is also the residence of the Anglican Bishop. Nearby points of reference include Old Saint Paul's Church and the Ministry of Justice. With origins in the middle of the 19th century, Sexton's Cottage is situated in the Thorndon area. Containing a host of original features and period timber architecture, the cottage is particularly historic, being built in the 1850s by soldiers from the 65th Regiment. Wellington City Library, in the city's lively Thorndon district, is one of the most striking, contemporary landmarks in the city. Housing a vast collection of books, documents, maps, local artefacts, historic drawings and New Zealand newspapers, the building is also home to a Pacific history section and the Alexander Turnbull Library.